FAIRFAX, VA – March 27, 2019 – 1901 Group appoints two seasoned industry leaders, Bob Beck as its Senior Director of Business Development for Department of Defense market and Zack Orchant as its Director of Business Development for the Homeland Security Market. Both will support driving growth and building long lasting customers and partners. Beck is a well-known figure with over 30 years of experience in government business development, financial management, and implementing strategies within the public sector marketplace. 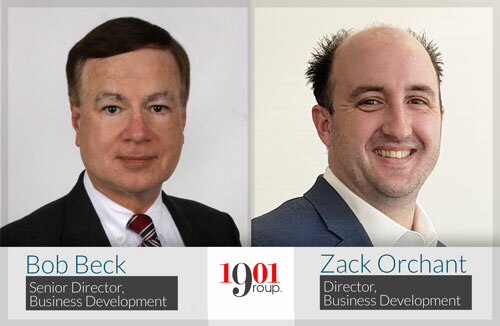 Beck joins 1901 Group after serving as Vice President and General Manager for IPsoft Government Solutions (IGS) building a portfolio of artificial intelligence (AI) and cognitive computing offerings including an AI ability to assist veterans in completing disability claim forms. Beck served as the DoD Account Executive with CSRA (now General Dynamics Information Technology) doubling the company’s Cyber Security practice during the first year of implementation. Within the industry, Beck has also held Vice President of Business Development positions with L-3 Integrated Systems (now CACI International Inc.) leading a $255 million competitive procurement for the JDISS, and roles with Titan Corporation and Raytheon. Orchant brings over a decade of experience as a leader in developing strategic direction and pursuit of multifaceted opportunities within government agencies such as DHS, DOJ, Federal Financials, and Federal Healthcare organizations. He built a successful career where he served as a Business Development Executive with United Data Technologies where he successfully led and executed the pursuit of onboarding to the GSA GSS program. Prior that, Orchant led pursuits at CDWG for the Department of Homeland Security Enterprise Computing Service Program and Department of Justice ITSS-5 Program, and at MicroTech he captured contract wins including a $17.5M multi-year task order for Army CID Law Enforcement Advisory Program and FBI ITSC BPA. Orchant has also held Business Development positions with Telos Corporation and Symantec Corp.